America’s biggest and most exciting sporting event is taking place on Sunday, February 1st at the University of Phoenix Stadium in Glendale, AZ. This will be the third time the Super Bowl has come to Phoenix, home of the Arizona Cardinals. The stadium typically holds a seating capacity of around 63,400 but is expected to hold 72,000 when the Seahawks square-off against the New England Patriots. After the outdoor experience of 2014’s Super Bowl XLVIII, the game will once again be held in a temperature controlled environment. Commercial airline services typically find themselves inundated with travellers whenever major sporting events occur and remain impractical alternatives to flying by private charter. Even those who have experienced the benefits of Business Class often praise the comparative advantages that private aviation has to offer the modern day traveller. Running the gauntlet of security checkpoints at commercial airline terminals can upset even the best laid plans. •	Expediency: We fly direct to your destination and can even arrange to have a limousine waiting for you on the tarmac or at the FBO only a short walk away. •	Flexibility: In most cases our services can be secured overnight and we’ll be able to have a jet waiting for you at your desired time, fuelled and ready for takeoff. DuPage Aerospace currently operates out of the DuPage Airport which offers an advanced airfield, a high-technology business park and a Robert Trent Jones championship-style golf course, whilst maintaining clear approaches to runways and properties dedicated to other airfield activities. 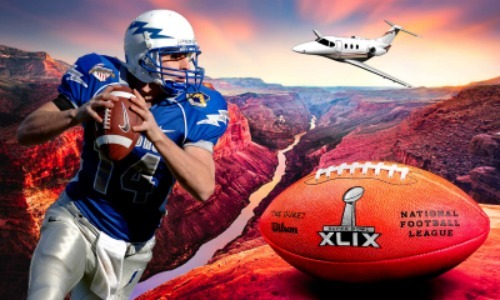 As part of our Super Bowl XLIX packages we can provide personalized private charter services to suit your individual needs with our diverse fleet of Lear, Hawker, Falcon, Challenger and Gulfstream jets. Contact us today with all your inquiries should you need further information. Note that our flight services are not strictly limited to major sporting events around the country and our clients are able to charter private jets to international luxury destinations. You’ll find our experienced concierge service accommodating and adept at handling the specifics of your travel arrangements.